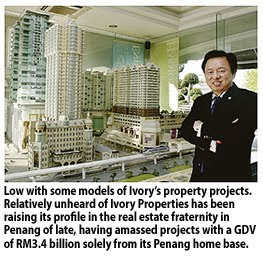 Ivory Properties Group Bhd, one of Penang's top property companies, plans to join other big players in the country by expanding into Selangor, Kuala Lumpur and Indonesia. Its group managing director Datuk Low Eng Hock said the company has been building itself from scratch for the past 11 years and is now setting its sights on projects outside its traditional stronghold. "We have received numerous enquiries to carry out property projects in Kuala Lumpur, Selangor and Medan, Indonesia. "We are in the midst of talking with various parties, including listed property companies, to carry out projects either on a joint venture basis or on our own," Low told Business Times in an interview in Penang. Soon-to-be listed Ivory expects to raise RM44.9 million via its initial public offering (IPO) slated by June 10, after postponing its listing plans since 2008 due to the weak market situation. Low said the company's forte include adding value to existing but slow-selling projects as well as rescuing and reviving abandoned projects, rejigging them and then reconceptualising the projects to catch the attention of buyers. This provides a win-win situation for Ivory, buyers, authorities and the land owners. "Although land is limited in the Klang Valley, there are many slow- selling projects or abandoned projects which we can turn around together with our joint-venture partners or carry out on our own," he said. Low added that Ivory plans to grow beyond its "rescue mission", but to do so would require massive capital expenditure which is a handicap for a private limited company such as Ivory Properties. "That is why we are going for listing to raise money required for our future expansion as well as boost our credibility," said Low, who is a civil engineer by training. Low said he gets ideas to boost sales of slow-selling properties from looking at newspaper advertisements in countries such as Hong Kong and Singapore, and emulating and inspiring his staff on how property players there do sales as well as come up with revolutionary building designs. PETALING JAYA: Danajamin Nasional Bhd has guaranteed the RM200mil private debt securities programme of Asian Pac Holdings Bhd’s subsidiary, property development company Syarikat Kapasi Sdn Bhd. In statement, Danajamin said Syarikat Kapasi would be utilising the funds raised to finance the construction of a real estate development project in Kota Kinabalu known as KK Times Square II, which would comprise a retail shopping mall, serviced apartments and shoplots. Danajamin chief executive officer Ahmad Zulqarnain Onn said Danajamin’s financial guarantee enabled a wide spectrum of companies to access the bond market for funding. “The increased accessibility allows more companies to raise long-term borrowings to finance their businesses at a reasonable cost of financing,” he said. Danajamin is the nation’s first financial guarantee insurer, which was established to provide financial guarantee insurance for bond/sukuk issuances to enable viable Malaysian companies to access the bond/sukuk market for capital-raising. It has approved a total of RM1.7bil guarantees as for to-date for companies in various industries including oil and gas, property and construction, plantation and infrastructure. SYDNEY: Australian house prices surged 20% in the year to March, the fastest pace on record and a powerful argument for the central bank to raise interest rates this week. Other data released yesterday showed Australian manufacturing activity running at its fastest pace in eight years, while a private gauge of inflation pointed to percolating price pressures as the economy gained steam. All of which stoked speculation the Reserve Bank of Australia (RBA) would pull the trigger on another rate rise at its monthly policy meeting on Tuesday, which would be the sixth increase in seven meetings. “All the various measures of house prices are now growing in the double digits and that’s a major plus for household wealth, consumption, building employment and the like,” said Brian Redican, a senior economist at Macquarie. A Reuters poll of 21 analysts taken on Friday found 16 expected the cash rate to be raised 25 basis points to 4.5%, making 150 basis points of policy tightening since October. Investors were reluctant to bet too heavily on a rate rise, having been burned badly in February when the central bank chose to skip a move. Interbank futures showed a near 60% chance of an increase while a measure from Credit Suisse put the probability at 66%. If the central bank does choose to keep its policy rates steady on Tuesday, the market is almost certain it will get to 4.5% in June and then keep nudging up rates to 5% or 5.25% by the end of 2010. Some had thought that market uncertainty over debt stricken Greece could deter the central bank from raising rates this week, but that risk had diminished after Athens agreed to a 110 billion euro aid deal. The Australian dollar bounced from its lows on the day following the housing data. PETALING JAYA: Penang-based Hunza Properties Bhd’s net profit surged 95.26% to RM11.29mil for the quarter ended March 31, 2010 compared with the previous corresponding period on higher property sales and contributions from the Gurney Paragon project. The company said in an announcement to Bursa Malaysia yesterday that revenue for the quarter jumped 214% to RM58.52mil. SUNWAY Holdings Bhd's wholly-owned subsidiary Sunway Marketing Sdn Bhd will partner Opus Developers and Builders Pte Ltd to set up a joint-venture company and expand its business to India. The joint-venture group known as Sunway Opus International Trading Pte Ltd, will import and sell finishing products like sanitary wares and fittings, ceramic tiles, marble, pipes, iron-mongering and hardware products, paints and home furniture. Opus has several construction and property development projects in Hyderabad, India, including the iconic Sunway Opus Grand, a joint venture between Sunway City Bhd and Opus.